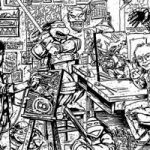 One day in early 1984, Kevin Eastman and Peter Laird were sitting around in Dover, New Hampshire, talking and drawing pictures. 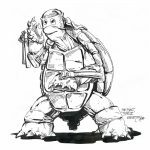 Eastman was joking and drew a turtle wearing a mask and holding a nunchaku. Laird liked it and drew his own version. Eastman called the new character, Ninja Turtle. Laird added his two cents by tacking on Teenage Mutant. 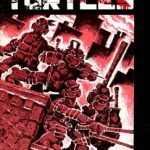 Thus was born what has unquestionably become the most popular ninja comic to date – Teenage Mutant Ninja Turtles. How popular have the “Turtles” become? Well, one issue alone sold 135,000 copies. 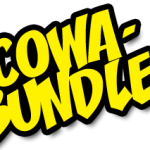 Also, another company (Solson) liked the idea so much they licensed the name and characters for a period of time, thus, confusing the comic-buying public with two magazines with the same name. The whole idea of turtles doing ninjutsu also set off a side craze – martial arts animals. Now there are ninja ducks and samurai walrus to name a few. 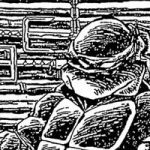 Laird, 33, co-writes and co-draws the turtles with Eastman, 33. The two get help from artist Michael Dooney. 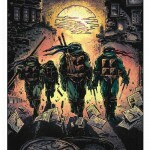 The difference between their ninja turtle comic and Solson’s is the storyline, Laird said. “Ours is strictly a fiction adventure story and Solson’s is a training manual.” The basic plot, according to Laird, goes something like this: A good ninja kills a bad ninja and moves to New York. While the good ninja trains, his pet rat (who is quite intelligent) watches his martial art moves very carefully. Eventually, the son of the bad ninja catches up with the good ninja and kills him and his wife. The bad ninja belongs to a clan of ninja called the Foot. With the good ninja dead, his pet rat is lift homeless, wandering on the street. Fate steps in when a truck carrying some kind of mysterious chemical accidentally drops a canister by the rat and a kid carrying four turtles. 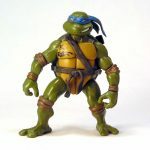 A “glowing ooze” from the canister covers the rat and the turtles, who begin to mutate and grow – eventually turning into Donatello, Raphael, Michaelangelo and Leonardo – the Teenage Mutant Ninja Turtles. The rat becomes their teacher and is called Master Splinter. Together they battle the forces of evil and bad ninja. 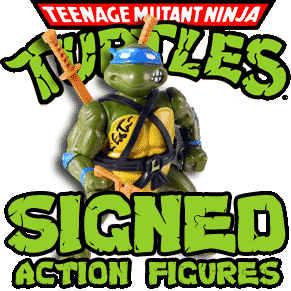 For back issues or more information on the original Teenage Mutant Ninja Turtles, write to Mirage Studios, PO Box 417, Haydenville, Massachusetts 01039.